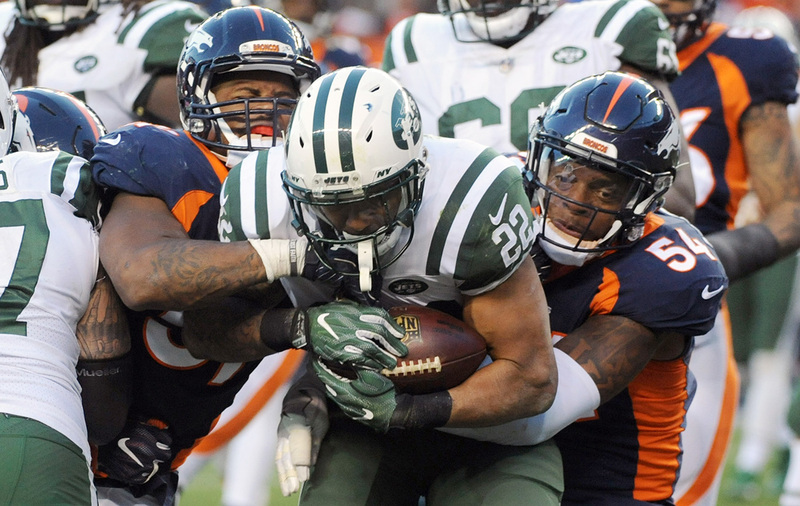 On second-and-17, with three minutes left in the third quarter, Broncos linebacker Todd Davis backs into a deep hook-curl zone, only to reverse field in pursuit of a dump-off pass from Jets quarterback Josh McCown to Matt Forte. Davis, Forte and Broncos safety Will Parks meet at once, and somewhere in the collision Davis’s ankle turns too far. He’s already missed two games due to that ankle. In a 21-0 loss to the Chargers, offensive tackle Russell Okung (an ex-teammate) dove to clip Davis from behind as he surged into the backfield to make a fourth-quarter stop. (“It was actually a dirty play,” Davis says. “I was going to make the play and he was definitely behind me, and he just decided to take me out.”) The ankle has bothered him since, requiring roughly a half-pound of tape on game days to secure it in place. On this Sunday, Davis hops to his feet, stomps the ground and ultimately misses just one play. But a little more than 10 minutes (in real time) later, Davis is down again. He scraped across the field and caught Forte on an off tackle run, wrapped up the runner and together with teammate Brandon Marshall dragged him to the ground. Only Davis’s head hit the ground just as hard as Forte’s, sending pain shooting down the back of his neck. He tore his helmet off and writhed on the ground, shaking his head as his dreadlocks flopped across the grass. He’ll be asked where he is, what quarter they’re in, who the Broncos played last week, if they won, the score of the game and finally, what happened on the last play. He passes the concussion protocol, and he continues to play what looks like a meaningless game in a lost season for the Broncos. But this is his job, and these games make up a résumé. He’s an unrestricted free agent after this season, but his contract status won’t determine whether he suits up for Denver’s next game, in four days. It’s a pride thing. Part of the job is playing on Thursday, so after 13 games—nine of them losses—the Broncos will travel to Indianapolis for what will be the least-watched Thursday Night Football Game of the season. It’s the 2017 finale of a series of games that has drawn the ire of players and fans alike. The week prior to the Denver-Indianapolis matchup, Saints quarterback Drew Brees added his voice to the chorus of players calling for an end to the games, or at least a reduction. The NFL has demonstrated through statistics that Thursday Night Games don't produce a higher rate of injuries than Sunday or Monday games, but the NFL doesn’t account for players like Davis, who will go into Thursday Night Football hurt. Davis has injuries to his ankle, both shoulders and stiffness in his neck, but has every intention to stay off the injury report. Davis took The MMQB through each day of Thursday Night Football Week to find out what exactly what goes into the Sunday-Thursday turnaround. Davis (left) tweaked his ankle against the Jets on Sunday, but he still had to suit up again four days later. It’s Monday afternoon, and Davis is in front of a scrum of reporters, explaining what it means to play two games in five days. It’s a familiar refrain from players since the NFL expanded the package to include every team making at least one appearance per season beginning in 2012. What Davis doesn’t say is that, after Sunday’s car wreck he went home and was so tired he went straight to bed, forgoing the NormaTec Pulse Recovery System—a cold body sleeve provided to each player by the team for home use—and paid for it in the morning. Davis says in these weeks since the ankle injury, getting out of bed is a feat unto itself. He sleeps on his back now, rather than his stomach, to keep the foot in a normal resting position, and he wakes up long before he actually gets up. The Broncos this season, under first-year head Vance Joseph introduced a compulsory “Restoration Friday,” when players are required to go to the training room and address what ails them, whether they’re on the injury report or not. The training staff brings in between nine and 11 medical specialists—stretch and massage therapists, three different types of chiropractors, dry needling experts, etc.—to address every need within an hour window. Over time, the window extended to two hours and the trainers stopped taking attendance for Restoration Friday because players were consistently showing up without prodding. The Broncos won’t hit this week in practice; most of the NFL has conceded that contact during the two or three days of practice prior to a Thursday game hurts more than it helps. Before and after practice, Davis is on a steady diet of ice and stimulation. Electric currents are sent through his ankle via sticky electrode gel pads. He goes through Hivamat deep oscillation therapy, which creates an electrostatic field that provides pain relief and muscle relaxation, among other benefits. “They stick one pad on you and one pad on their hand, and once they touch you the current goes through,” Davis says. On Monday night he goes home to his wife and their infant child, and gets a visit from his personal body guru who puts him through a massage therapy regimen. The session will include extra attention on his shoulders, which have bothered him since injuring one in the preseason. Since separating it the first time, doctors told him if it keeps happening it might require surgery. “Thank God it didn’t,” Davis says. It’s Tuesday morning, and Davis takes Naproxen, a nonsteroidal anti-inflammatory drug, with breakfast. He’s taken it every day with breakfast and dinner since injuring the ankle. It’s another uptempo walk-though day for the team, with the focus on recovery. Five players are listed with ankle injuries, while six others have injuries including an Achilles strain, a lower back injury, shoulder trouble and wrist injuries. Outside linebacker Shane Ray, who required surgery on an injured wrist in training camp and played this season with the wrist heavily taped, says the defense was fortunate to have dominated the Jets offense the Sunday prior. The Broncos allowed just 100 total yards—41 passing and 59 rushing—and six first downs in a 23-0 win. If Sunday had been more of a slugfest, more players would be struggling to play Thursday, Ray says. Davis will undergo much of the same treatment he did on Monday—massage and electronic stimulation to the ankle meant to relieve pain and break up scar tissue. At night he applies Voltarin, a diclofenac sodium topical gel (another nonsteroidal anti-inflammatory drug) to his right ankle. On Wednesday, Joseph lets the team sleep in prior to its 1 p.m. flight to Indianapolis. Davis goes through the same routine upon arrival—ice and stimulation—in addition to the team walkthrough. Away games are tough on the injured, because the flights often put pressure on the injuries and create more swelling that needs to be addressed by training staffs. They get a late wakeup time on Thursday morning—11 a.m.—and Davis spends the morning watching the movie The Hitman’s Bodyguard in his hotel room. He arrives at the stadium in time to have his ankle taped as heavily as anyone on the field. First, a layer of pre-wrap, then athletic tape, then socks, then cleats, then another layer of tape around the shoes and ankle to secure it all in place. Davis says you can’t play less aggressively with injuries—that’s how you get hurt—but you can make minor tweaks to your game to protect your body. Since separating his left shoulder and “tweaking” his right shoulder, he tries to avoid coming into contact with full arm extension. He says he comes off blocks tighter, driving through and around blockers in ways that allow him to keep his elbows close to his core, and he tackles with less wingspan at the point of attack. Before the game he takes an oral dose of Toradol, a pain-relieving drug that until recently had been administered via injection and was being taken prophylactically, against the advice of a 2012 study by the NFL Physicians Society. The group recommended Toradol not be “used prophylactically as a means of reducing anticipated pain either during or after participation in NFL games of practices and should be limited to those players diagnosed with an injury or condition and listed on the teams' injury report.” But it left discretion up to team staffs. A 2015 lawsuit by more than 1,800 former players put the spotlight on the drug and forced teams to curtail what had been known in some cities as the “T Train,” the line of players standing outside a gameday training room waiting for the pain-numbing dosage. He’ll collect just two more tackles over 28 snaps in a 25-13 win—once Denver opens up a nine-point lead late in the third quarter they spend most of the rest of the game in dime personnel, meaning less work for Davis. He avoids injury on Thursday, but a handful of Colts aren’t nearly as fortunate. Tight end Brandon Williams is put on a stretcher and carted off the field after a frightening collision during a special teams play. He’s immediately hospitalized, and revealed to have suffered a concussion but not a spine or neck injury. In total, five Colts found their way onto the injury report: linebacker Jeremiah George (neck), offensive lineman Denzelle Good (knee), defensive tackle Johnathan Hankins (shoulder), tight end Jason Vander Laan (concussion) and Williams. The only Broncos player added to the list is wide receiver Cody Latimer, who is questionable the next week with a thigh injury. Davis says if he entered last week's game against the Jets at 90% health, he was about 85% for Thursday Night Football. That speaks to the concern many fans have beyond increased injury risk, that because players are at less than full health, TNF games seem sloppier than the ones played on Sunday. Davis cherishes the opportunity to play in primetime: “Anytime we can play in front of the whole country, under the lights is a blessing,” he says. “It’s tough but I like it. I think we struggle with it, but they [Indianapolis] do too. Everybody’s slower. It’s an even playing field. “I think it’s obvious that guys are more banged up during Thursday Night Football. The body just doesn’t have that time to recover that you would normally have. It’s tough getting on the field but once you’re on the field you gotta play."